Advanced Fluid Systems represents several fluid power products specifically for the power generation industry. Some of these include Moog servo valves and actuators; Hy-pro filtration products, EHC solutions and fluid filtration / dehydrators; and custom filtration and lubrication systems designed, manufactured and installed by Advanced Fluid Systems. Hy-Pro’s SVR soluble varnish removal system is specifically designed to remove varnish causing contaminant while in solution, without removing critical oil additives. The ICB element technology removes the soluble oxidation by-products before they can cause damaging lube oil varnish. Operate 24/7 and remove soluble varnish while the turbine is running or off-line. Particulate filtration for contamination and larger insoluble varnish particles to ISO code 14/12/10 and better. Top loading ICB element housing and built-in winch for easy element removal and maintenance. Custom options, several electrical supply voltages and explosion proof components are available. Standard options include an automatic drain valve and solid state switches for reliable, 24 x 7 unattended operation. Dedicated Filtration Systems for Harmful Water and Moisture. 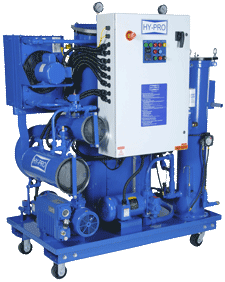 Hy-Pro’s VAC-U-DRY vacuum dehydration systems are mobile, self-contained systems for hydraulic or lube oil applications where harmful water is present. Remove and prevent acid, lacquer, gel and sludge before they can damage your system. Reduce and maintain Acid Numbers (TAN) to less than 0.05 without introducing traditional acid scavenging minerals to your system. Eliminate gels and deposits by removing dissolved metals (CA, Mg, Fe, Na, Si, and AL). Other benefits include: rugged stainless steel construction, superior media capacity, axial flow maximizes fluid-media contact time, and more. Hy-Pro Filtration designs and manufactures several fluid conditioning solutions for Electrical Hydraulic Control (EHC) systems that utilize phosphate ester fire resistant fluids. ICB Element Upgrade: Eliminate and prevent EHC servo valve sticking and reduce fluid maintenance requirements by educing acids and minerals that form deposits and gels. ICB elements are also used in the SVR soluble varnish removal system (See right). TMR Reservoir Headspace Dehydrator: Eliminate the primary catalyst of acid production by removing moisture from the air mass in the reservoir. Dry air mass transfer extracts dissolved water from the fluid, extending its useful life. ECR (Electrostatic Contamination Removal) System: Remove large quantities of insoluble sub-micron particles. The Hy-Pro/EPT ECR system removes pre-varnish, lacquer, gel and sludge particles from less than 100 nanometers to 5 micron in size. NSD Non-Sparking Element: Eliminate oil degradation and anti-oxidant additive depletion associated with high voltage static spark discharge. After several tests, Calpine Energy has recently authorized only Hy-Pro’s NSD elements over other manufacturers. Keep your turbine controls operating like new and reduce downtime and operating costs. Moog is a world leader in electric and hydraulic servo actuators and turbine control solutions. As your authorized Moog repair distributor, Advanced Fluid Systems processes your actuator repair paperwork and provide customer service through out the order cycle. All repairs are performed at the Moog factory with factory original parts by trained technicians. Advanced Fluid Systems can also help you install your actuator assembly at your facility and repair your related process valves. Moog factory servo valve and pump repair is a cost-effective and timely option to purchasing new components. Due to the tolerances and Moog’s commitment to quality, Moog does not sell replacement parts for its valves and pumps. Only Moog can perform factory authorized repairs ensuring that your valve or pump operates to its original specifications. Moog’s factory repair service is a fast, cost-effective service for restoring your Moog products back to their new condition. All repairs are performed with Moog quality parts and are fully tested by Moog’s repair team in East Aurora, NY. Contact the Advanced Fluid Systems’ Repair Department to receive a Moog RGA #. Include the Moog model number, serial number, the symptoms/reason for the repair and any comments or expedite requirements. Advanced Fluid Systems will fax (or email) you the Moog repair form along with the address and instructions for returning your valve directly to Moog. As soon as Moog contacts us with your repair evaluation, we will send you a copy of the Moog inspection report and pricing and delivery options. *** While Moog will repair your component, Advanced Fluid Systems will be your purchase order vendor and invoice ‘remit to’.